Rideau Station on Ottawa’s Confederation Line. 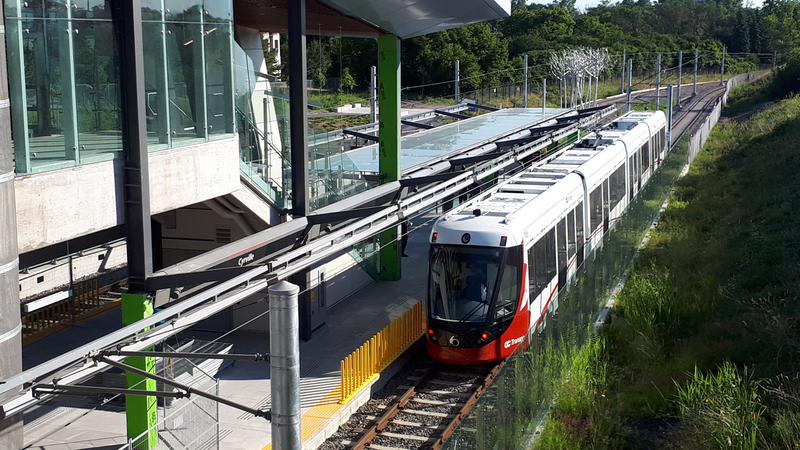 Ottawa (Ontario) City Council, in a landmark 19-3 vote, has approved Stage 2 of the city’s Confederation Line LRT project, as well as a crucial extension to the Trillium Diesel Multiple Unit operation. This represents the largest capital project in the National Capital’s history. However, Stage 1 of the Confederation Line continues to experience delays. Meanwhile, in Alberta Province, the Government of Canada, through its agency Infrastructure Canada, recently announced federal funding totaling more than C$1 billion for two Edmonton LRT projects. 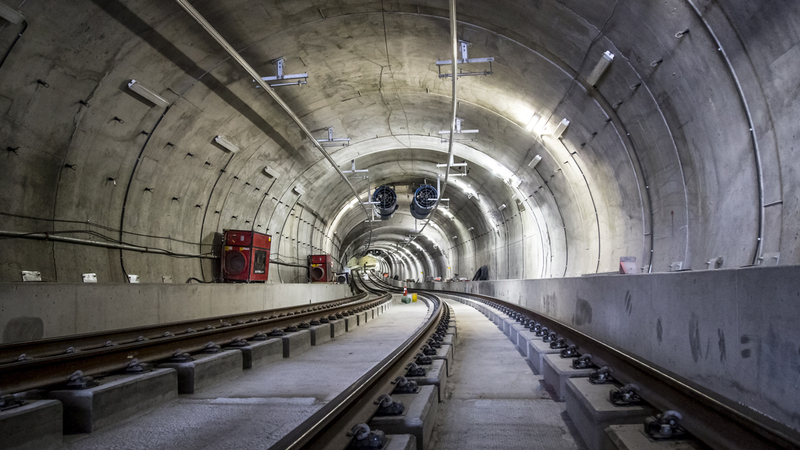 The estimated total cost of Stage 2 of Ottawa’s Confederation Line is C$4.7 billion, which is C$1.2 billion more than the original estimate. The federal and Ontario governments have already committed $2.4 billion in funding. 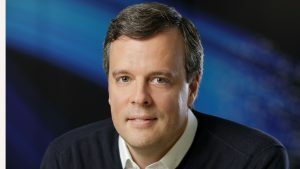 The contract was awarded to East-West Connectors, a consortium including Kiewit and Vinci. Their role will be to finance, design and build the two LRT extensions. The eastern extension, with five new stations, will proceed 12.5 kilometers (7.75 miles) from the existing Blair Road Terminal, to Trim Road, in the suburb of Orleans. The western extension, providing 11 stations, is to be built from the existing Tunney’s Pasture terminus, to Moodie Drive, 15 km (9.32 miles), with a branch to Algonquin College, located at Baseline Road. Construction is planned to begin later in 2019; opening of the Trim Road line will be in 2024, with the western section in 2025. The extensions will be mainly on surface alignments. 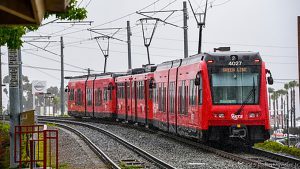 An order for an additional group of Alstom Citadis Spirit LRVs, similar to those on the existing Confederation Line, has been placed. Final assembly will take place in a new building adjacent to the existing Belfast Road shop. 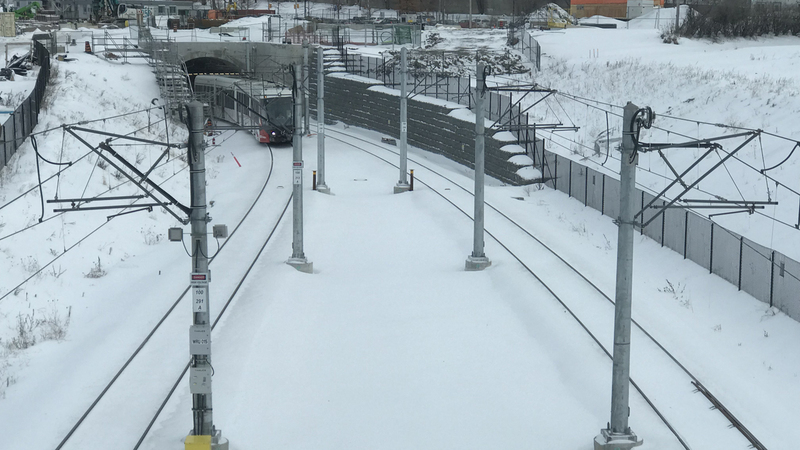 Yet, as Stage 2 is gets under way, the much-delayed opening of the C$2.1 billion, 12.5 km (7.75 miles) Stage 1 of the Confederation Line suffered another setback recently. Contractor Rideau Transit Group, a consortium of ACS Infrastructure Canada, EllisDon, SCN Lavalin and others, told City Council that it could not meet a March 31 deadline to turn over the line in completed condition. However, RTG committed to a new handover date before June 30. The previous missed deadlines were May 24 and Nov. 2, 2018. Train testing at Cyrville Station. The physical work is almost finished, with several stations slightly less than 100% complete. The major delay relates to acceptance of all 34 Alstom LRVs. At press time, 24 cars had been certified as being ready for service. 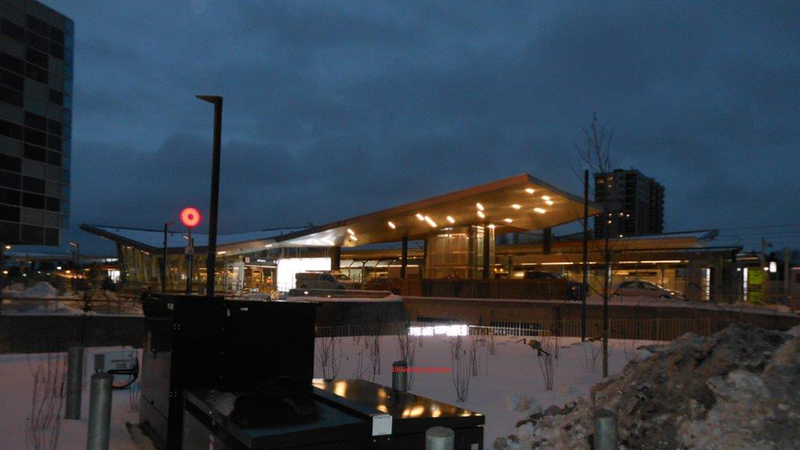 The system is semi-automated, with a Thales on-board CBTC system; OC Transpo Operators will be present in backup roles. Running tunnel between Lyon and West Portal. A test using 15 coupled two-unit trains needs to be completed successfully as part of Ottawa’s acceptance of the line. The 15 MU sets represent peak service operation, with four LRVs as spares. Dependable operation during Ottawa’s severe winter has been another factor. Rideau Transit Maintenance, RTG’s maintenance branch, has purchased a snow melter to clear the tracks, and will run storm trains overnight during major snowfalls. The route is chiefly above ground, in open cuts. Train testing at West Portal. Once Ottawa accepts the project, a further 30 days, allowing for a thorough inspection and checking by city staff, will elapse before the public opening. This could be on July 1, Canada’s National Holiday. The city has been withholding payments to RTG since February 2018, due to the missed milestones. Significant financial penalties could be levied. 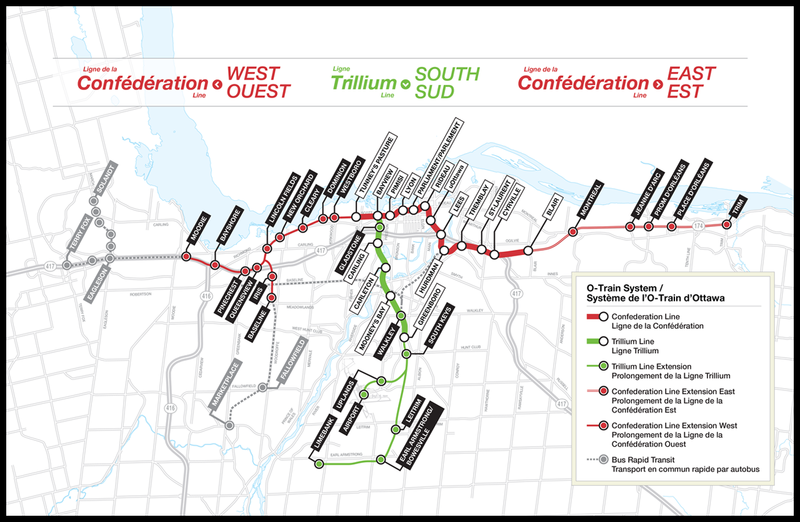 Ottawa’s Trillium Line DMU extension will be 16 km (10 miles) in length, to Riverside Station, with a branch to Ottawa Macdonald-Cartier International Airport. Eight stations will serve passengers. 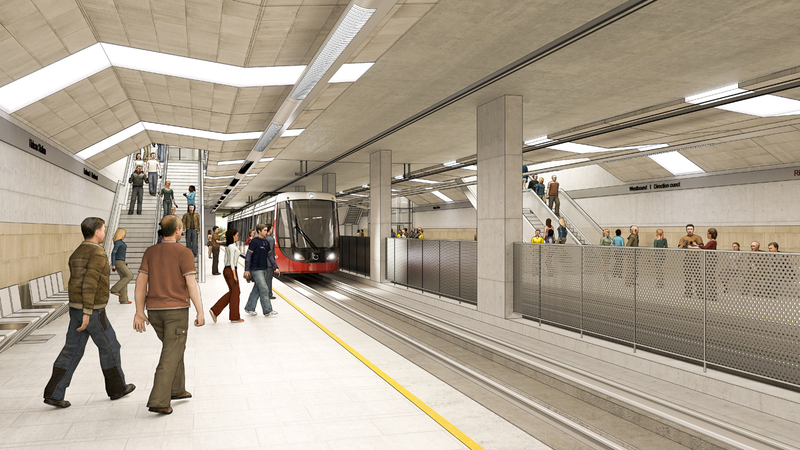 There will be a passenger connection at the north end to the Confederation Line’s Bayview Station, which is on a higher level. 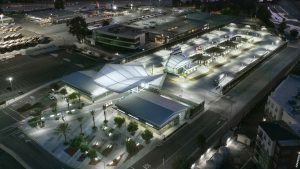 The construction contract was awarded to TransitNEXT. The Trillium Line opened Oct. 15, 2001, using three Bombardier Talent trainsets. It operates over a short section of the former Canadian Pacific Prescott Subdivision, from a terminal near the Ottawa River. It proceeds southward, serving Carleton University, terminating at Greenboro Station, near a shopping center. Six Alstom trainsets provide service at present. Meanwhile, in Alberta Province, Infrastructure Canada recently announced Federal funding totaling more than C$1 billion for two Edmonton LRT projects. A grant of C$948.6 million from Ottawa, combined with C$1.04 billion from Alberta and C$637.1 million from Edmonton, will extend the Valley LRT Line 14 kilometers (8.7 miles) from its downtown Edmonton northern terminus to the west end suburb of Lewis Farms. The Metro Line Northwest LRT will be extended 1.5 km (0.9 miles) from its current Northern Alberta Institute of Technology Terminal to the new Blatchford development. Funding for this project consists of C$127.2 million federal; C$131.2 million provincial; and C$69.6 million from Edmonton. The plan is to ultimately extend this line further northwest to the Edmonton City Line, and possibly into the suburb of St. Albert. 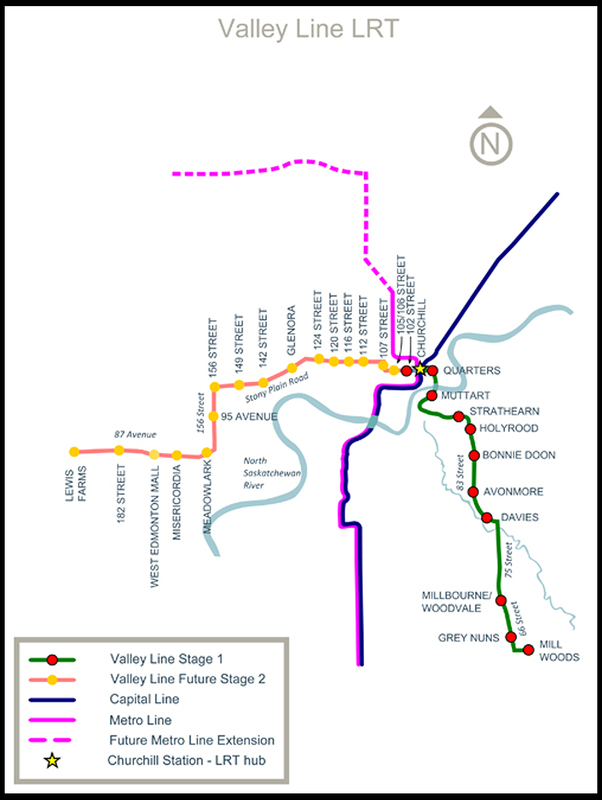 The first stage of the Valley Line extends from downtown Edmonton to the Mill Woods station in southeast Edmonton, a distance of 13 km (eight miles). 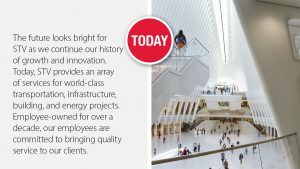 Construction is in an advanced stage, with opening scheduled for late 2020. It will be Edmonton’s first low-floor LRT, using seven-section Bombardier Flexity LRVs currently on the Millhaven (Ontario) assembly line. The Northwest LRT, as a branch of the original Edmonton LRT route, will be a high-floor operation.